What the H*** Is Up with Illinois? First it was Blagojevich, then it was Roland Burris. And before that, an improbable presidential candidate from Illinois won the presidency. Clearly, Illinois is in the news. What’s up with Illinois? Illinois has a long history of power grabs and corruption, and this seems to be a habit that dies hard. 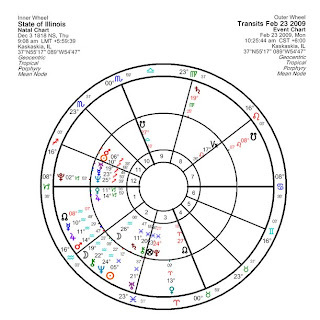 A look at the astrological chart cast for the time that Illinois became a state gives us insight into the hidden dimensions of current events. Both Mars-Sun and Uranus-Mercury tend to act with lightning speed. And when you put planets in the 12th house, OR when Neptune enters the mix, there arises a mistaken impression that “no one will notice”. All of this ends up a toxic mix for the unenlightened. There is one more potential cluster bomb in Illinois’s chart: The Chiron-Fortuna-Pluto conjunction on the 3rd cusp in mysterious Pisces. This reminds us of the Democratic Machine and (still disputed) vote rigging and ballot-box stuffing of the Boss Daley era. It also speaks to a mindset where much activity in government takes place sub rosa. Which of these groupings is more responsible? We don’t have to decide, because they are connected to each other so that their overall effect is augmented. They form a complex square configuration that would challenge the most honest among the powerful. It is even more telling that this configuration is being spotlighted over recent months (since, oh, about the time that Obama announced his candidacy for the presidency two years ago), but even more dramatically since last fall, as the Saturn-Uranus opposition began to harden. This has brought the veritable worms out of the woodwork, first in the form of newly impeached Governor Rod Blagojevich, now all those who have been touched by him, including Roland Burris. It is worth noting that each man’s natal chart ties in with this part of Illinois’s chart. If you thought Illinois were going to disappear off the map of current events, you are wrong. Saturn and Uranus continue to dance across the corruption configuration through March 2010. However, there are many other ways to use this pattern, and Illinois has many other fine attributes, leaders, and moments in history. For one thing, there will be some form of celebration for the 200th anniversary of Lincoln’s birth throughout the year. For another, our shiny, new President Obama is from this fine Midwestern state. On the darker side though, it is possible that the situation with Senator Burris may not be resolved until into 2010, when the Senate seat may be up for election; or if the legislature changes the law as is expected, when another person takes the senate seat after a special election. Of course, the criminal case against Blagojevich could easily stretch on into 2010 — and beyond. Yesterday (Monday) was Korean Supreme Leader Kim Jong-Il’s birthday, complete with the obligatory fanfare and dancing. This was Kim’s first birthday since two rumored strokes have kept him out of circulation since September 2008. Looking at his birth chart, it is no surprise that he has had health difficulties. Although there are many planetary events to point to, the primary culprit is Neptune. This planet of dissolving influences was strong in his chart (square to Uranus) when he reportedly suffered his first stroke in September. A second contact transpired over late December through the first two weeks of January. Given that Chiron, the Wounded Healer, and Jupiter are traveling over the same point this year, he may not be long for this earth. Chiron and Jupiter are frequently featured in charts at the time of death, since death involves a release from the constraints of the physical body into the unbounded inner realms. Madeleine Albright Had It Right. If you want to keep North Korea happy and peaceful, you have to give Kim attention. It is very obvious that he falls into the character structure category of the “oral” type (conceived by Wilhelm Reich and more fully developed by John and Eva Pierakos). Secretary Albright had his number when, during the Clinton Administration, she gave him the respect and recognition he craved from Western sources. Had Bush followed Clinton’s foreign policy with North Korea, Kim may never have felt it necessary to develop nuclear capabilities as an attention-seeking behavior. If he gets the attention he seeks now with the latest threat to conduct a nuclear test, he won’t need to fire the rocket. Think of it as his way of inviting Secretary Hillary Clinton to his country and manipulating her (the US) into pledging humanitarian aid to his beleaguered nation. Not that we should feel sorry for him (that’s what he wants — a big pity party), but by understanding what makes him tick, we can avoid further difficulties with this sad man. Secretary Clinton, for her part, seems to understand what it takes and is making placatory sounds in his direction. 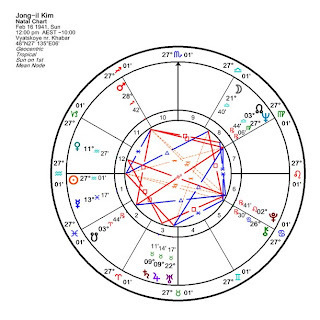 It is not clear what his successor will be like, but since he has not named a successor among his sons to our knowledge, there could be considerable chaos in the inner circle following Kim’s passage from power — suggested by Uranus, Neptune, and Pluto contacts to the chart of North Korea in the coming 2-3 years. This morning’s penumbral eclipse was not visible in locales where weather obscured it, but it is still being felt around the globe. In the United States, it has a particular impact, since it hits several significant points in both the US chart and that of our national leader, President Barack Obama. This tells me that this eclipse is one of the more important to be experienced by the nation in recent times. The interactions between the US chart and the chart cast for the eclipse in Washington, DC, speak to the discussion that fills the news — the economy and the stimulus package that is supposed to rescue the American people. Most notable among the interconnections is the conjunction of the US Lot of Fortune (Fortuna) to the Ascendant of the eclipse chart. Fortuna has, obviously, to do with “fortune” or money, but it also has to do with well-being or health. 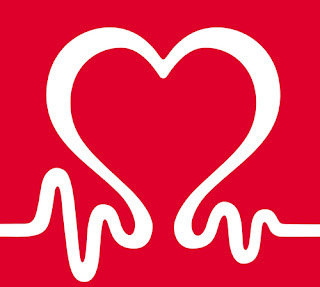 The health of the nation is therefore highlighted, more in terms of economic health (this being in the US 8th house) than literal physical health. The Wound Is Being Healed. Chiron is there too, very close to Fortuna. This suggests that a long-standing wound in the national psyche is being addressed, if not healed. These placements, found in Aries, have to do with the tendency for people in power to place self-interest over the interests of the nation. Highlighting this factor is the location of the eclipse itself, at 21̊ Leo-Aquarius, lined up on the US Moon, the symbol of the people. The people are the linchpin in the process before us, and the people will lead the way forward. Already we can see this, as President Obama appeals directly to the public today and tomorrow through a prime-time press conference and town-hall meetings in Elkhart, Indiana, and Fort Myers, Florida. In doing so, he is making ample use of the planetary energies available to him. 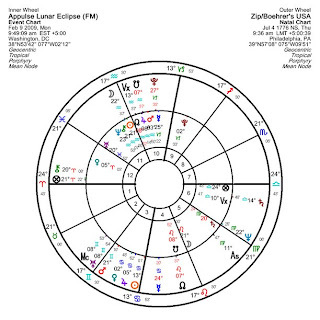 This is something of a watershed moment for Mr. Obama, as the eclipse Full Moon opposition is aligned critically with his Ascendant-Descendant (the east-west horizon line of his chart). This can feel like a make-or-break time for him, as if he is being called upon to dig deep into his character to muster the “right stuff” for this task. He is called upon to reassess his way of relating to others, and to make adjustments — which he is doing. I believe that this has to do with his “bipartisanship initiative”, turning it into a long-term project instead of something he can use as a foundation of his approach to the legislature in the current moment. The importance of this process to the nation is underscored by the fact that the Sun of the US chart, representing the life force of the nation, is squarely on the IC of the eclipse chart. This takes us all to our heart, to deeply question what is important to us, what makes this country thrive, and which political viewpoint (if any) we resonate with. Given the other planetary pattern out there — the conglomerate in Aquarius — the way of the future will not be the way of the past, and the new way forward will prevail. Even though it looked last week like the Republican retro-economic plan was going to steal the stage, Mr. Obama is reshaping the dialectic quite eloquently, much to the dismay of the Republican right, which is still struggling to find its feet in the dawning new era. I don’t believe that this stimulus package has it all perfectly correct. I’m with progressives like Novel Winner Paul Krugman, Robert Kuttner, and Rachel Maddow on what we need (so far) — to spend more on things like infrastructure and to make sure jobs are created. The government CAN do this, but it is not going to get as much bang for the buck with so many tax cuts. As you read this, Saturn and Uranus are giving each other a nod from across the skies, making their second opposition in a series of five. This is one of the most challenging of planetary combinations, as there are no more dissimilar planets than these. Saturn holds the status quo and is (not necessarily politically) conservative, because its job is to build things that last, then do what’s required to maintain them. No passing the buck here. Uranus on the other hand gives us the sudden, sharp shock to the system that brings it back to life where it has stagnated, sometimes triggering radical change. It induces flexibility, vitality, and rejuvenation. This is what happened with the election in November. To see how stunningly these planets can interact, consider the probability of electing the first African-American president of the United States, directly after George W. Bush! This Is the Time of Our Maximum Divide. In politics, the exact opposition of Saturn and Uranus also has to do with the divide between progressive elements in government and “retro” conservative elements that resist change. Each of these archetypes tempers the other and needs to co-exist to create a healthy (government) system. On a deeper level, what we are seeing is the rebalancing of the scales between these two segments of government. One of the possible effects of an opposition in human affairs is a hardening of factions, and that’s what we see now. This has resulted in one of the shortest presidential honeymoon periods on record. This hardening of the arteries of government now threatens the life of the nation and its ability to survive. In this, the second opposition, it is the time of our maximum divide --- when a shift has begun, but the old deposed faction is running scared and hasn't yet seen the good in it all. However, this is not surprising, if you understand human behavior. When there is a sea change brought on by events, people are thrust deep into their inner, psycho-spiritual wound. They are frightened, and all their deepest fears are articulated internally, about their own survival and whatever shadows of the past remain there. The Republicans as a group are frightened about their survival. They are thrashing around like a trapped animal, fighting for their life. It is no wonder that the hardest most bitter side of their persona is being expressed right now. It’s the only way they know how to play the game, yet they do not see how their adamantine position makes the situation infinitely worse. Obama is trying to get them to play democracy again, and over the long haul, they may — they must — start doing so. However, it is likely to take the full extent of the Saturn-Uranus interaction — through July 2010 — for them to get it. The factions were not built in a day, and they will take time to break down. It is understandable that, as Saturn and Uranus make their second opposition, the stimulus package would become the football in a petty king-of-the-hill skirmish. With the Republicans holding the nation’s economy hostage over less than 1% of the package’s spending, it is truly a case of barking and whining at shadows. It All Started With the Two Santa Clauses. The seeds for this shift in power were planted in the 1960s during the Civil Rights Movement – and the last time Saturn and Uranus opposed each other. There is a revealing article by Thom Hartmann, “How The Republican Party Has Conned America for Thirty Years”. It details the cataclysmically simple manner in which the Democratically developed “good for all” system was sabotaged by Republicans in a blatant power grab that showed careless disregard for the good of the nation. By 1974, Jude Wanniski had had enough. The Democrats got to play Santa Claus when they passed out Social Security and Unemployment checks--both programs of the New Deal--as well as when their "big government" projects like roads, bridges, and highways were built giving a healthy union paycheck to construction workers. They kept raising taxes on businesses and rich people to pay for things, which didn't seem to have much effect at all on working people (wages were steadily going up, in fact), and that made them seem like a party of Robin Hoods, taking from the rich to fund programs for the poor and the working class. Americans loved it. And every time Republicans railed against these programs, they lost elections. In 1976, he rolled out to the hard-right insiders in the Republican Party his "Two Santa Clauses" theory, which would enable the Republicans to take power in America for the next thirty years. Democrats, he said, had been able to be "Santa Clauses" by giving people things from the largesse of the federal government. Republicans could do that, too--spending could actually increase. Plus, Republicans could be double Santa Clauses by cutting people's taxes! For working people it would only be a small token--a few hundred dollars a year on average – but would be heavily marketed. And for the rich it would amount to hundreds of billions of dollars in tax cuts. The rich, in turn, would use that money to import or build more stuff to market, thus increasing supply and stimulating the economy. And that growth in the economy would mean that the people still paying taxes would pay more because they were earning more. And thus we have the current situation. What will come of this rebalancing process, the first that occurred after the mid-60s revolutionary period? Obama is set on reconciling the opposites, because that is what he has to do in so many ways with his chart. His birth chart is full of paradoxes, and he is hard for people to figure out because of that. As long as he maintains his center and does not throw himself (and his principles) away to the conservatives, he will be successful. However, he’s learning too. I am deeply disappointed in the direction of his economic team, which is essentially headed by Larry Summers. However, I am not surprised. It is highly unlikely (but sad to see) that in human affairs of state we will get it right on the first try. There will be at least one more economic stimulus plan, because this one isn’t going to work very well. Too much of the old system is still incorporated in the plan: tax cuts to the wrong people, pay-outs to corporations, as concessions to the Republicans. It isn’t progressive enough — Summers isn’t listening to the right voices. Perhaps the Democrats are discovering that they have the power to put in the process what they REALLY want, and that they need to come to the table with their full agenda, instead of putting what the Republicans want in before negotiations start. It is okay to bring your full vision of perfection into the light of day, even though it has been deeply damaged in the past. Withe the Saturn-Uranus interaction lasting two years, it represents a long process that does provide rewards over time. Many Democrats are bitter and resentful about the way they were cruelly ostracized and marginalized when the Republicans were in the majority. Yet, the best way to heal the chasm that exists between the two parties is to listen to and be open to each other. Evidently, the Democrats will be teaching the Republicans how to do democracy again, and revive the heartbeat of the nation. Now that Uranus has injected its dynamism, the situation has been turned on its head: The outsider-progressives are now in the status-quo position, and the Republicans the radical opposition. We are just about learning to cope.